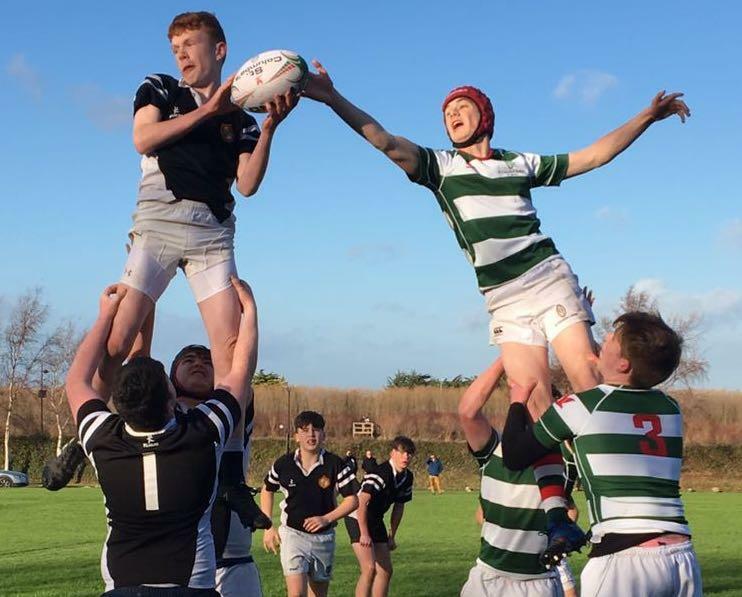 Last Thursday, the College hosted the first round of the Leinster Schools Rugby McMullen Cup with the Senior Cup Team (SCT) taking on Árdscoil Tríonióde from Athy while the Junior Cup Team (JCT) took on the same opposition in the Duff Cup across the driveway. The SCT continued their excellent form to date brushing aside Árdscoil 24-10 in a physical and pulsating fixture. Árdscoil started the brightest and were soon 0-3 ahead when they slotted a penalty inside the Columba’s 22. The home side fought back and were soon on the scoreboard after an excellent kick behind the Athy defence allowed George Guinness cross the whitewash – Thady McKeever converted to give the home side a 7-3 lead. They soon followed that up with another excellent try, this time from centre Hector Wright with Thady’s conversion now making it 14-3 at half time. In the second half, the home side began to exert further pressure on Árdscoil and soon after the restart a great run from Max Hopkins, and quick ruck ball, allowed Hector Wright dot down for his second try – this time the conversion eluded McKeever and the score remained at 19-3. Number four soon followed – this time from James Wilkinson – and Columba’s were cruising at 24-3 and looking like winning their first senior cup game in a number of years. Árdscoil managed to grab a late consolation but it was St. Columba’s that progressed to the next round – against Coláiste Cill Mhantáin on Wednesday. The JCT were extremely unlucky in their fixture against Árdscoil. A slow start and some meek defence saw the visitors go into an early lead, 0-7, but St. Columba’s fought back well in the second half. An excellent touch finder from Matthew Russell allowed their effective line out set up an unstoppable maul before Mikhail Sukhachev picked from the base and crashed over. Russell added the conversion and the sides were level. SCC started to play some expansive rugby – which suited their abilities – and their increasing confidence was rewarded with another try as flying winger Luis Malaga dotted down. Russell couldn’t land the difficult touchline conversion but they led 12-7 with five minutes remaining. Alas, it was not meant to be. Árdscoil came back and began to string some phases together – their large pack picking and going effectively and drawing penalties. With 90 seconds on the clock they crash over and the easy conversion, between the posts, ensured they left with the spoils and moved into the next round. While the cup competitions were taking place on the main pitches arguably the most important game was taking place on the Ducks pitch. Our youngest boys hosted their “arch-rivals” Headfort and recorded a (rare) victory over the visitors. The game started well with fierce tackling and hard rucking for both teams. Some strong running from Caleb Owen saw him score a try in the first half before Ben Paterson led an infamous Mr Cron ‘black ball’, which bamboozled the Headfort defence, and Ben was able to fall over the try line without any opposition. Some good defence from SCC meant the half time whistle was blown by the Warden with the score at 10-0. The second half started well and St. Columba’s started to dominate the match. Pavlo Shvalov and Caleb Owen scored tries with strong, straight running and effective hand-offs. The try of the game was set up by Caleb Owen who picked and went blind and, after breaking a few tackles, was able to offload out of a tackle to Tom Larke who ran in from halfway and dotted down under the posts. A pleasing win for a Ducks side with much potential, with the return fixture to come next week away at Headfort. So, mixed fortunes but a lot of great rugby on show on a sunny, crisp November afternoon.